Among his many punishments, Jimmy suffered ‘cuts’, a particularly brutal form of Naval punishment. Offenders, known in the Navy as “defaulters”, were mustered every morning and went before the Commandant for a formal hearing, where if aged under 18 they could be “awarded” up to 12 “cuts” — very hard strokes of a heavy cane, administered that same morning with maximum force by burly and skillful ship’s police or Master-at-Arms. “The allegation that the trousers Beaumont was made to put on for his caning were torn and threadbare is unfounded. The punishment duck trousers kept in the Guardhouse for such purposes have been inspected and the material that covers the buttocks were seen to be in good condition”. White ducks were baggy in the legs but quite snug-fitting around the groin and lower torso so that, when the wearer bent over at 90 degrees to be disciplined, the flimsy fabric would be drawn smooth around the behind and up into the crotch, thereby tautening the buttocks and accentuating the lower part of the seat. Thus the effectiveness of the caning was maximized while still satisfying the legal “with clothes on” requirement. The ceremony was elaborate, slow and solemn. The miscreant stood to attention while the offense and punishment were formally read out, and he was then tied or held bending across a desk, field gun, gym horse or bitts. With as much as one minute elapsing between strokes, the whole procedure could take 20 minutes per boy. The cane was a Nilchert rattan, 40 inches long and half an inch in diameter, bound with cord in two or three places to prevent splitting (information from official Admiralty correspondence in 1950). This is actually longer by 4 inches than it had been in 1906. It was about twice the thickness of the typical state secondary-school cane, but then its “customers” were mostly aged 16 or 17 — a couple of years older than most schoolboy recipients at the time. (A thicker cane would bruise more, but lacerate less, than a thinner one.) According to some accounts, the instrument was soaked beforehand in linseed oil to make it heavier and more supple. A sore, heavily bruised and wealed backside was the inevitable and intended consequence of this form of discipline. The weals typically lasted at least 14 days. Sitting down would be very uncomfortable for a while, especially as ship’s police were trained to aim the cane at the area between the horizontal center of the posterior and the gluteal crease. There is some anecdotal evidence that boys were sometimes allowed to take their meals standing up for a day or so after receiving cuts. Particularly after a maximum caning of 12 strokes, there might also be slight bleeding where cuts had crossed over each other, according to some accounts. All recipients who have commented on the matter seem to agree that the experience was not one they ever wished to risk repeating. Several accounts describe boys emerging from the punishment room after “12 cuts” scarcely able to walk, dazed with pain and shock. Antiseptic lotion would be applied in the sick-bay afterwards as necessary. 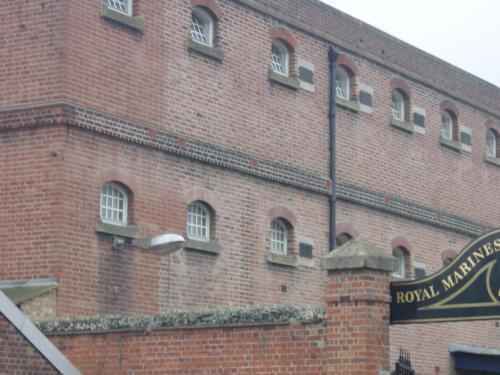 Huge land-based institutions such as HMS Ganges, on the Essex coast, containing many hundreds of youths between 15 and 18, and these became famous for strict discipline enforced by very severe formal caning. Boys joined on leaving school, and were usually there for a little less than two years (only one year, in later times). 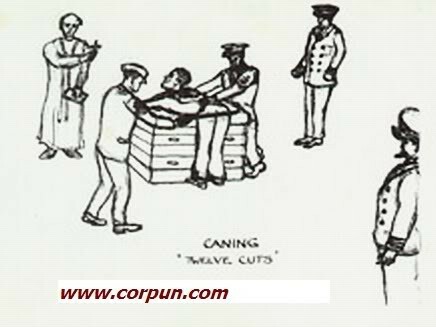 Statistics for the 1930s indicate some 200 official caning’s per year on HMS Ganges alone, an average of four per week. The Brock Committee on Naval Discipline in 1912 found that “strict discipline and unfailing obedience are more essential than ever” in the modern Navy, and that “caning is by far the most suitable punishment for boys”.